The new LTU20 series 2-wire ultrasonic transducers provide non-contact level measurement up to 15m (50 ft ) and are ideally suited for challenging corrosive, coating or waste liquids. Featuring very high efficiency narrow beams and wide frequency bandwidth, they work in many conditions over wide temperature range. 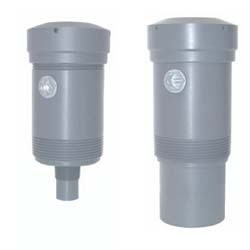 LTU20 series transducers provide a self-cleaning operation, so their faces eliminate almost any buildup and condensation. The ultrasonic probes adapt to most environmental conditions as their power and receiver sensitivity adjust automatically to any distance and reflecting object thus keeping the same echo amplitude over the operating range. LTU20’s can be calibrated, in process or outside process, with simple push-button calibration. Standard construction is PVC for housing and mounting fitting. For severe applications, other materials, such as FEP, are available for the mounting fitting (and transducer).